Superb walking country, fine pubs and accommodation, and easy access from surrounding cities make the Derbyshire Peak District a perfect destination for a weekend walking break. What are you waiting for...? Please note: vehicular access to Callow Top is strictly for guests only. Non-residents should begin these routes elsewhere. Mappleton and the River Dove (2 miles): A quick stroll to the village with a brief riverside interlude. Fenny Bentley (3¾ miles): Along the Bentley Brook to an interesting village and church. Hanging Bridge & Okeover Park (4¾ miles): Valley and parkland views on either side of the River Dove. Thorpe and Dovedale (6½ miles): Above and along the Dove valley to a Peak District classic. Tissington Trail Cycle (8 or 15 miles): Glorious mountain bike routes with long stretches off-road. Please note: parking at Bolehill Farm is for residents only. Public car parks at Over Haddon, Monyash, Bakewell and Ashford. To the Lathkil Hotel, Over Haddon (1¾ miles (one way)): A short, one-way stroll across the fields to Over Haddon to visit the Lathkil Hotel. Return via the same route. Magpie Mine & Sheldon (4¼ miles): A walk over Bolehill to the historic remains of Magpie Mine, with an optional extension to the village of Sheldon and its pub. Over Haddon & Lathkill Dale (4¾ miles): A visit to Over Haddon and a taste of glorious Lathkill Dale. Ashford & Sheldon (5¾ miles): A walk down into Ashford-in-the-Water with glorious views on the way down, followed by a riverside and woodland return to Sheldon and then back via Magpie Mine. Lathkill Dale & Monyash (9 miles): Field paths via Over Haddon to the glorious limestone valley of Lathkill Dale. After a lunch stop in Monyash, the return is across fields visiting the atmospheric remains of Magpie Mine. Bakewell, Ashford & Sheldon (9 miles): Field paths via Over Haddon to the historic town of Bakewell, returning via the scenic Wye valley, a quiet wooded side-dale, pretty Sheldon and the atmospheric remains of Magpie Mine. Ladyclough Woods (2 miles): Riverside and forest walking with no major hills to climb. Fairbrook Clough (4¾ miles): An energetic climb is rewarded by stunning views over the Snake Pass from the northern edge of Kinder Scout. Ashop and Kinder Scout (8 miles): Two valleys, one quiet and remote, the second intimate and pretty, linked by a dramatic gritstone edge walk. Please note that parking at Mo Cuishle is for guests only. Non-residents please start these walks elsewhere. Millthorpe and Barlow Woodseats (4½ miles): A hilly walk to a pretty village and historic private house, with two picturesque fords to add interest. Linacre Reservoirs (4½ miles): A lake- and streamside stroll in a wooded valley with distant views of Chesterfield’s twisted spire. Monk Wood and Barlow (5½ miles): Hills, woods, streams and villages: a varied hike around the Barlow valley. Birchen Edge (1½ miles): See Nelson’s Monument and the Three Ships - a short walk with lots of interest and great views over Derbyshire. Gardom’s and Birchen Edges (3 miles): Pleasant woodland and moorland walking with two contrasting edge walks and more great views. Chatsworth and Baslow (7½ miles): A walk full of interest and contrast, from prehistoric rock art to grand architecture to classic Derbyshire gritstone. Lantern Pike (3¼ miles): Climb to our local hilltop with splendid views over Hayfield village to Kinder Scout. New Mills & the Millennium Walkway (6 miles): Experience the dramatic Torrs gorge, a section of the Peak Forest Canal, and wide views over the Sett valley. Kinder Scout (11 miles): Take a classic gritstone hike to Derbyshire’s highest hill and tallest waterfall, plus pretty Hayfield village. Priestcliffe (3¼ miles): Surfaced roads and tracks with fine views over the Wye valley. Chee Dale (3½ miles): Adventurous familes will love this walk through some of the Peak District's most impressive limestone scenery. Chelmorton & Deep Dale (6 miles): Flowery meadows, a riverside stroll, spectacular limestone scenery, a pretty village and a prehistoric burial site. Five Wells & The Waterloo (3½ miles): Stroll to a prehistoric burial chamber and a friendly pub. Millers Dale and Priestcliffe (4¼ miles): Superb views, riverside walking and a Derbyshire Wildlife Trust nature reserve. Monsal Dale and Taddington (9 miles): A classic Peak District dale and a pretty village. The Monsal Trail (10 miles): A hearty walk or an exciting route on a mountain bike. Tideswell on foot (5 miles (one way)): Via the stunning Wye valley and pretty Tideswell Dale. Buxton on foot (6½ miles (one way)): A varied walk via hill and dale into historic Buxton. Buxton by bike (10¾ miles (one way)): A quiet mountain-biking route with several off-road sections. Peak Forest Canal (2¼ miles): Good views over Whaley Bridge on the outward journey, and an easy canalside return. Whitehough and Eccles Pike (3½ miles): Starting out along the Peak Forest Tramway, returning via a climb to a fine viewpoint. Cracken Edge (4½ miles): The climb to the quarries of Cracken Edge is rewarded by a high-level promenade with industrial relics and fine views. Whaley Bridge & Peak Forest Canal (2 miles): Over the hill to the historic canal town of Whaley Bridge, with an easy return along the towpath. Eccles Pike (3½ miles): A short but energetic stroll to a prominent local landmark, with glorious views in all directions. South Head and Cracken Edge (8½ miles): A hilly all-day walk with pub stops available at various points along the way. Peak and Speedwell Caverns (2¼ miles): Stroll through pretty Castleton village and visit two of the area’s famous limestone caverns. Winnats and Cave Dale (5 or 6 miles): Two spectacular limestone gorges with an optional ascent to the hillfort and viewpoint on Mam Tor. Lose Hill and Hope village (7¼ miles): A classic ridge walk to a fine viewpoint, followed by a visit to a historic village and a pleasant riverside return. Please note: vehicular access to the site is for guests only. Non-residents should begin these routes elsewhere. Deep Dale & Chelmorton (4½ miles): Impressive limestone cliffs and caves, a pretty village and a cosy local pub. Buxton via Cowdale (5 miles): A one-way stroll through a series of hamlets to the historic spa town of Buxton. Taddington and Chee Dale (10¾ miles): A series of villages in spectacular limestone country, with an exciting riverside stretch. Five Wells (3¼ miles): Stroll to a prehistoric burial chamber with fine views. Horseshoe and Deep Dales (3½ miles): An interesting walk through fields and impressive limestone scenery. Five Dales round (9 miles): Experience at length the dramatic limestone scenery of five dales, including a beautiful stretch of the Derbyshire Wye. Please note: parking at Churn Barn is for residents only, and there is little or no parking in Maynestone Road. Cracken Edge (3½ miles): Quarry remains and superb views over the valley to Kinder Scout, Chinley and Eccles Pike. South Head (6½ miles): An energetic stroll along the Pennine Bridleway with gentler streamside interludes. Edale Station (7¾ miles): A demanding linear mountain-biking/hiking route over the shoulder of Kinder Scout. Combs village and Reservoir (1¼ miles): A short, mostly level stroll round the village and its idyllic wooded reservoir. Ladder Hill & Combs Reservoir (4¾ miles): A rewarding walk with superb views. Combs Moss circuit (9 miles): A scenic circuit of the little-known plateau of Combs Moss, featuring the imposing Castle Naze hillfort. Please note: parking at Stonecroft is for residents only. Upper and Barber Booth (4¼ miles): Sample the opening of the Pennine Way and explore three of the Vale of Edale’s pretty hamlets. Mam Tor and Castleton (6½ miles): Geological curiosities abound on this classic walk on the junction between gritstone and limestone. Kinder Scout and Snake Pass (13¾ miles): A demanding but spectacular moorland crossing of Derbyshire’s highest hill to visit an iconic coaching inn. Hardwick Park (1¾ or 2¼ miles): A level lakeside and woodland stroll with an optional climb through open parkland to Hardwick Hall. Stainsby and Astwith (5 miles): Two pretty hamlets with superb views over the Doe Lea valley to Hardwick Hall. Ault Hucknall (3½ or 5 miles): A parkland walk to a historic church, with an optional shortcut via Hardwick Hall. Silverhill Country Park (6 miles): A gradual climb to the one of the highest points in Nottinghamshire, returning via Hardwick Hall. Derwentside stroll (2½ miles): A pleasant riverside and woodland amble. Padley Gorge and Bole Hill (3½ miles): Millstones galore, and a rocky valley to explore. Stanage Edge (6¼ miles): A Peak District classic, visiting Little John’s Grave and Robin Hood’s Cave! Lantern Pike (3¾ miles): A stiff climb to a local beacon with superb views to Kinder Scout and over Manchester. Shooting Cabin and Little Hayfield (3½ miles): Our favourite local walk with our dogs including wide views, heather moorland and the pretty hamlet of Little Hayfield. Kinder Reservoir circuit (5 miles): A scenic and relatively low-level walk below the gritstone edge of Kinder Scout, using permitted paths and rights-of-way to circumnavigate Kinder Reservoir. Kinder Scout & the Downfall (8¼ miles): A classic gritstone hike, climbing to the Kinder plateau and Derbyshire’s tallest waterfall. 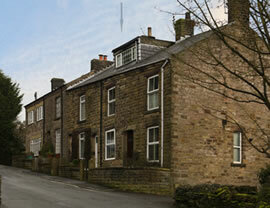 Hayfield village (1 mile): An easy stroll around the pretty village of Hayfield. Bowden Bridge & Peep-o-Day (4½ miles): A river and hillside walk with good views. Kinder Downfall round (9 miles): A classic Dark Peak circuit featuring a section of the Pennine Way. 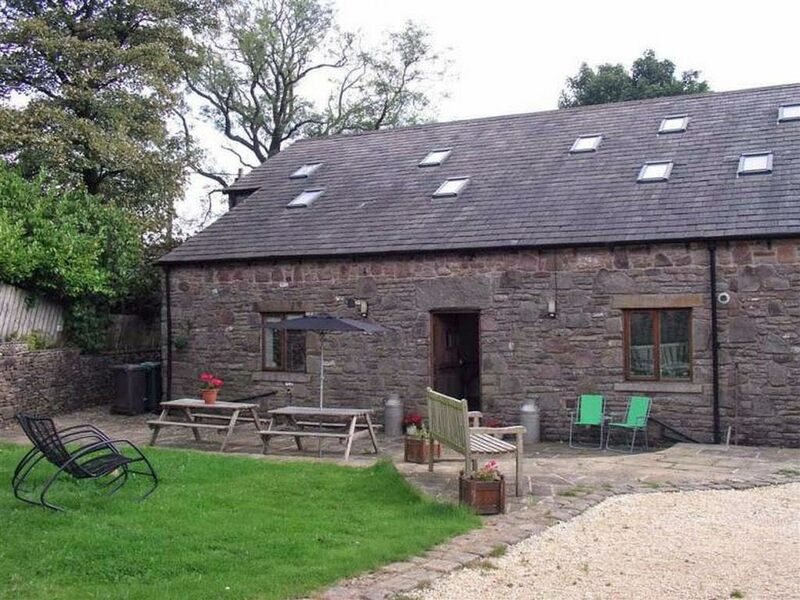 Bowden Bridge & Hill Houses (2 miles): An easy stroll visiting a historic packhorse bridge and a pretty group of farmhouses. Shooting Cabin & Twenty Trees (3 miles): A taste of heather moorland and fine views over the Sett valley. Kinder Reservoir circuit (5 miles): A stroll beneath the heights of Kinder Scout on little-used permissive paths around a scenic reservoir. Kinder Scout & the Downfall (7½ miles): A challenging but rewarding edge walk to Derbyshire's highest waterfall. Hope village and the River Noe (1½ miles): A gentle stroll round the historic village with a pretty interlude along the River Noe. Win Hill (4¼ miles): A stiff climb to a superb rocky viewpoint with a delightful return through heathery hillside and riverside meadows. Castleton and Lose Hill (7¼ miles): A riverside stroll to Castleton, returning via the Great Ridge and the fine viewpoint of Lose Hill. Callow Top & Tissington Trail (2½ miles): Good views over the Dove Valley, and a short section of the Tissington Trail, a disused railway. Okeover Park (3½ miles): Superb open parkland, historic buildings and extensive views over Mappleton, the Dove Valley and beyond. Thorpe and Dovedale (5¾ miles): A walk of endless vistas, visiting a Peak District classic and returning via an extended stroll along the beautiful Dove. Whitle (1¼ or 1½ miles): An easy stroll, featuring fine views up the Sett valley to Kinder Scout, and a pretty hamlet of old cottages and farmhouses. Cobden Edge (3¼ miles): A scenic walk over the hill behind the Pack Horse, featuring wide westward views over Manchester and the Cheshire Plain. The Millennium Walkway (4¼ miles): A moderate stroll down into New Mills, returning via the spectacular Millennium Walkway and a pretty riverside park. Lantern Pike (5¾ miles): A rewarding walk to a fine local viewpoint, returning via the Sett Valley Trail, a disused railway line. Roman Bridge (6 miles): A scenic hike (also suitable for mountain bikes) along ancient trackways to a packhorse bridge over the River Goyt. New Mills & Strines (6½ miles): Stroll down into New Mills via pretty Whitle, cross the spectacular Millennium Walkway, then climb to the Peak Forest Canal, before descending to cross the Goyt and then climbing back to the Pack Horse via Brook Bottom, another attractive hamlet. Monyash & Flagg (5.4 miles): Follow flower-lined green lanes to two limestone villages, and sample a short stretch of the High Peak Trail. Flagg & Chelmorton (5 or 6 miles): Wander via field paths and country lanes through the villages of Flagg and Chelmorton, returning on the High Peak Trail. Crowdecote & Pilsbury Castle (7.6 miles): Take a rewarding hike via a scenic hilltop to a pretty village and a Norman castle site in the Dove valley. Arnfield & Swallow’s Wood (3 miles): A leisurely reservoir and woodland stroll, visiting a local nature reserve. The Longdendale Chain (3¾ miles): Mostly level walking around one, two or three of the reservoirs of the Longdendale valley. Crowden via Lad’s Leap (8¾ miles): A demanding moorland walk with superb views, followed by an easy and level return. Please note: access to the site is strictly for guests only. Non-residents should begin these routes elsewhere. Tissington Trail stroll (2¼ or 3 miles): A mostly level stroll through meadows and along a stretch of the former railway line. Parwich circular (4½ miles): Walk to a picturesque village green and pub, returning via pasture land. Dovedale (8¼ miles): An all-day Peak District classic, with refreshment opportunities en route. Ballidon and the Tissington Trail (14¼ miles): Mostly on off-road tracks and cycle-ways. Bugsworth Basin & Chinley Park (2½ miles): Stroll along a former tramway to explore a historic canal basin, returning via a local nature reserve. Eccles Pike and Bugsworth Basin (5 miles): A stiff climb to a fine viewpoint returning via a route full of industrial archaeology. South Head Horseshoe (8 miles): A mixture of craggy gritstone uplands and softer valley country, including a section of the Peak Forest Tramway.